Q: Where do you currently reside in Maryland? My wife and I live on Kent Island on the Eastern Shore of Maryland. Q: How did you get involved with the USA Warriors Hockey Program League? 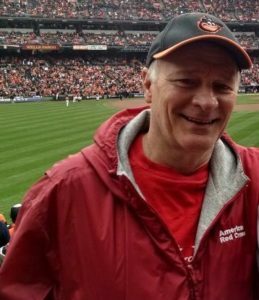 I had been coaching and playing hockey for years and was volunteering once a week for the Red Cross at the Walter Reed National Military Medical Center during the height of the Iraq and Afghanistan wars. A picture of some of the players from the recently-formed program was on the cover of the USA Hockey magazine. When I saw that, I immediately thought that the USA Warriors Hockey Program combines the two things that I volunteered for. So I joined the program as a volunteer. I found that the program needed organization and funding and was eventually elected President of the Board of Directors and able to stabilize the funding and organize volunteers to grow the program. I also worked with Walter Reed to incorporate our sled and standing hockey programs into their recreational therapy programs resident in the Occupational Therapy Department where I was a volunteer. I relinquished the Presidency several years ago but remain on the Board of Directors and head up the sled hockey program. We have a great President now, Lori Mezzanotte who lives in Pasadena, Maryland. We receive tremendous support from the DAV, Fisher House, the Washington Capitals, the Chicago Blackhawks who became close to our program when they visited Walter Reed, the NHL, the Rockville Ice Arena where we practice, Congressman Quigley from Chicago, Congressman Van Hollen from Montgomery County, Maryland and from other government officials, individuals and organizations. Q: What kinds of support/services do they provide Veterans? 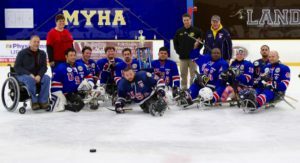 The USA Warriors Ice Hockey Program provides sled and standing hockey programs for disabled veteran. Our players have visible and invisible wounds such as PTSD, internal damage and visible injuries. The program provides the players with equipment, conducts weekly practices all year-round, and arranges games and fundraising and social events. Our sled and standing teams play in leagues. In fact, our sled hockey team, which I help coach, has played in the Northeast Sled Hockey League, the oldest and largest sled hockey league in the country, for three seasons now, traveling up and down the East Coast and elsewhere for games. It has won the league title the last two seasons and qualified to compete in the USA Hockey national sled championships. Some of our players never played hockey before; some had never been to an ice rink before they were brought to the rink to try hockey with our program. Q: Why is this program so important? The program gives the players, especially those who were patients at Walter Reed, something very physical to do each week despite their disabilities. It also gives them something very competitive to do and do well. Our players are very hard driving and working military people. Plus, the team environment gives them a sense of being part of a military unit again, something that they miss and, for those severely wounded in combat, that they were torn away from the moment they were injured. It allows them to be with others with the same experiences and who they can trust. So it is not just the hockey but also the camaraderie which the program provides that really helps these men and women who have given and are giving so much for our Nation. This program really helps disabled veterans. We are not entirely sure why, but it works. Q: What are some of the challenges running this program? The main challenge for me as with all the other volunteers is helping keep the program running in our spare time. We are an all-volunteer organization with no paid staff. At times we have funding issues and of course it is at times a challenge but always fun and rewarding dealing with these men and women who each have their own issues acclimating to their disabilities and living in the civilian world. We have had a hard time with USA Hockey, the governing board of hockey in the United States. Several of our sled players who have moved home after they left Walter Reed and want to and do continue to play with their teammates on the USA Warriors. They have never played for any other team. USA Hockey will not allow them to continue to play for our sled hockey team in the two premier sled hockey tournaments in the United States including the national sled championships for which the team including these players has qualified. That has been very difficult for me to come to grips with because USA Hockey’s decision has adversely affected several of our players and is causing problems within our program, despite our best efforts to try to get USA Hockey to change its mind. Q: Benefits running this program? I hope I have adequately described the benefits to the players. The benefits to me are a sense that I have in my own small way helped these men and women who will be affected for the rest of their lives by their participation in war and other missions that their country asked of them. I never served in the military and this is my way of making up for that in a small way. I am proud to be associated with these men and women. Plus we have lots of fun. Sometimes, especially after I have seen what our players have gone through and when I see them succeed. We have had three of our sled players make the US National Sled Hockey team and another four make the US Development Sled Hockey team. I am much older than these men and women and I can see what they will be up against not just for the few years that they are at Walter Reed or after they leave the service, but their whole life. It is hard for me at times when they and others who I helped at Walter Reed contact me over the holidays and on special occasions to wish me well. It is I who should be wishing them well. Q: What do you want the public to take away from this program? The public should know that war and military service affects our soldiers, marines, sailors and guards and their families for the rest of their lives after they get hurt or see or are involved in very difficult situations that we place them in. They volunteered to do it in defense of our Nation and for us. It is important that the public support disabled veterans for the duration and not just when the country is at war. The aftermath of war continues on and the public has an obligation to support our disabled veterans. The public can do that through volunteering for all sorts of programs involving disabled veterans, contributing funds to these programs and making sure our politicians and government officials support the right policies. I am really impressed by individuals who have really come through for our disabled veterans. But if for some reason or another an individual feels he or she cannot support our disabled veterans, then the person should in my view still volunteer and help the many other people in need. There is always someone who is worse off than we are in some aspect of life who can benefit from our help. To me, as Americans indeed human beings, it is our duty to help others in need. This can be done through participation in non-profit organizations like the Red Cross and the USA Warriors or one’s church or synagogue or local government. Q: Where do you see the program in the future? Not sure how long this program will survive but as long as it keeps helping our disabled veterans, I suspect that there will be volunteers keeping it going. I am not sure when I will bow out. My involvement has imposed on my wife and sons but they are very supportive and do what they can too.